Make ingenious split clamp rings for pulling together elements of a vacuum system etc. -- widely used at Brookhaven, etc. -- [J.? T.?] [Coor?] [sketch/picture] drawing of apparatus including: circle, attachments, A, A [sketch/picture] drawing of apparatus including: side view, clamp, O ring for [r?] 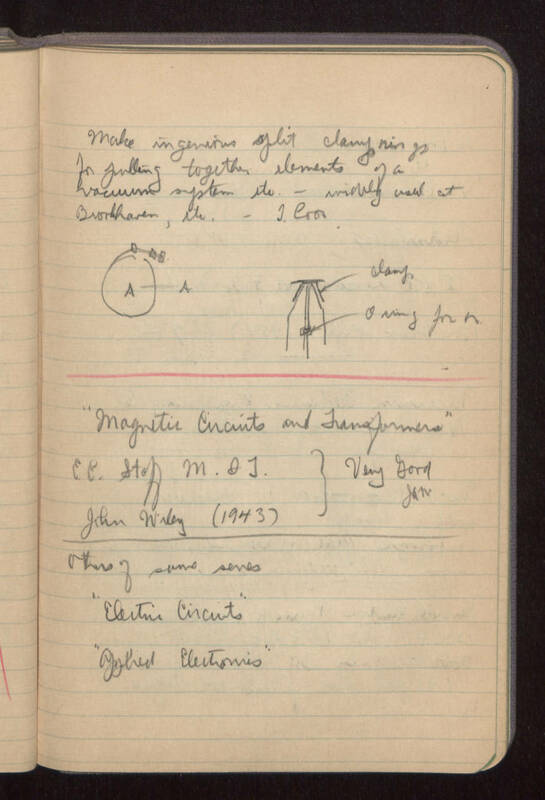 [red box above here] ----------------------------------------------------------------- "Magnetic Circuits and Transformers" E. E. Staff Massachusetts Institute of Technology John Wiley (1943) Very Good [J.A.V.A.? January?] ------------------------------------------------------------------ others of same series "Electric Circuits" "Applied Electronics"